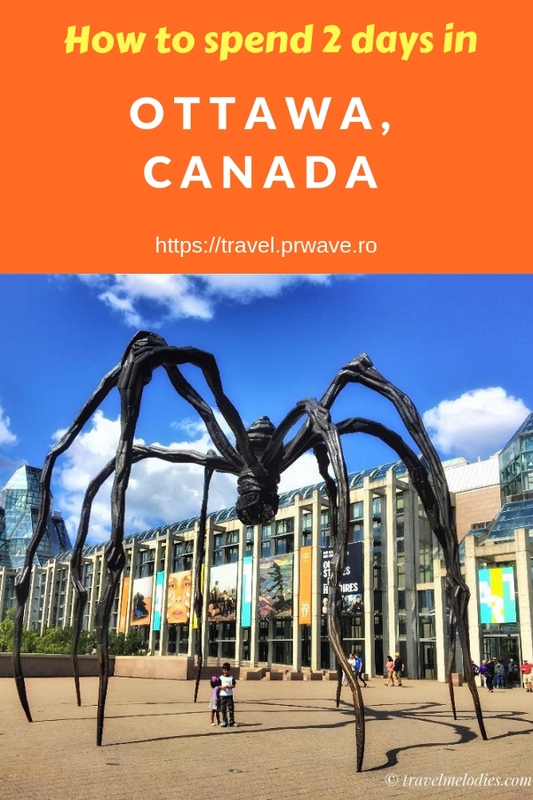 Planning a short trip to Ottawa, Canada? 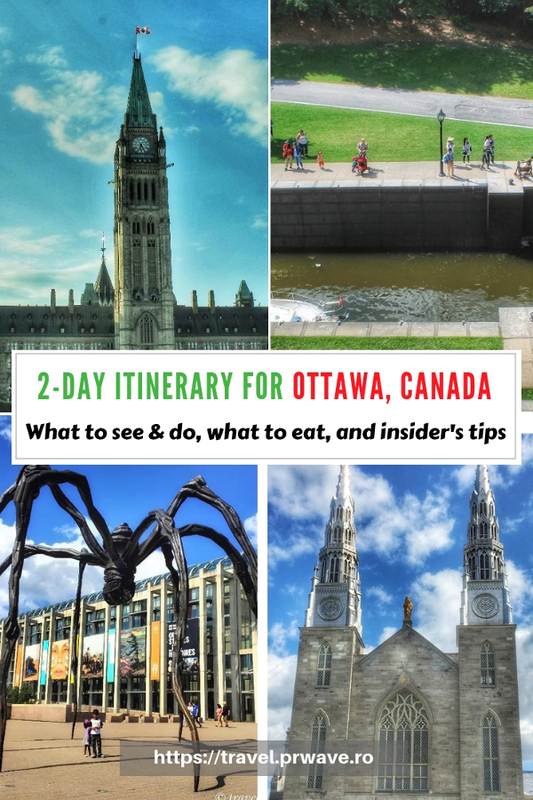 Here’s how to explore Ottawa in 2 days in this itinerary with the best things to do in Ottawa in 48 hours recommended by Neha from Travel Melodies. And, if you visit the city in spring, remember that you can also include the famous tulip festival on your list. Canada is one of the multicultural diverse county of the world. And it reflects in its parliament as well. But the capital of Canada- Ottawa is not just a political capital, it has art, culture and Victorian architecture to seek for. The best part of this city is that it can be easily explored on foot. So, let’s head out to explore Ottawa in 2 days. After a healthy breakfast let’s begin the day by visiting the most important attraction of the city -The Parliament Hill. 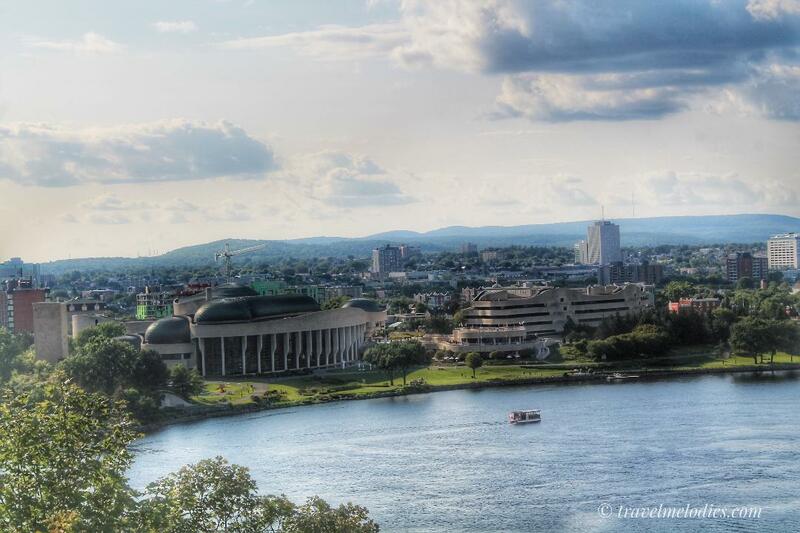 This political hub is a gorgeous structure on top of a hill on banks of river Ottawa. Three magnificent structures – Center, East and West blocks adorn around the sides of a huge lawn. Unfortunately, the Center block is getting closed for major renovations in 2018 for 10 years, but the offices would be shifted to West and East Block and tours will be available to delve into the history lasting 150 years. There are free bilingual tours in English and French available, lasting about an hour. Pro Tip: The free tickets for the tour are available from 9 a.m. at 90 Wellington Street (across from Parliament Hill). But we recommend reaching there at least an hour in advance to get your choice of time slot as the tickets are sold out fast. Separate tickets are required for all blocks and Peace Tower if you wish to explore all. Pro Tip: Be prepared to spend some time in detailed screening before you enter these significant buildings. The Parliament hill can be explored in other interesting ways as well. Read all about it. If you love eating fresh and healthy food, then this place is a must visit. Oh! how refreshing food, we could feel the flavors of each ingredient. The portion size was very good. It is open for visitors to see the proceedings and take 30-minute guided tours that acquaint about the operations of Canada’s judicial system. Pro Tip: Please check the timings and days of opening. It gets closed for lunch from 12-1 p.m. Walk along the Wellington Street from Supreme Court towards the Parliament Hill to reach Ottawa Locks. Rideau Canal, a UNESCO world heritage site connects many lakes and rivers. To make the water navigable, locks (gates to raise and lower the water levels to allow ships/boats to go) are installed. These locks are still operated manually the same way they were about 200 years back. The set of 8 locks that connect the canal to Ottawa river are called Ottawa locks. It is an experience to watch the functioning of gates. You can even walk over the locks when closed. 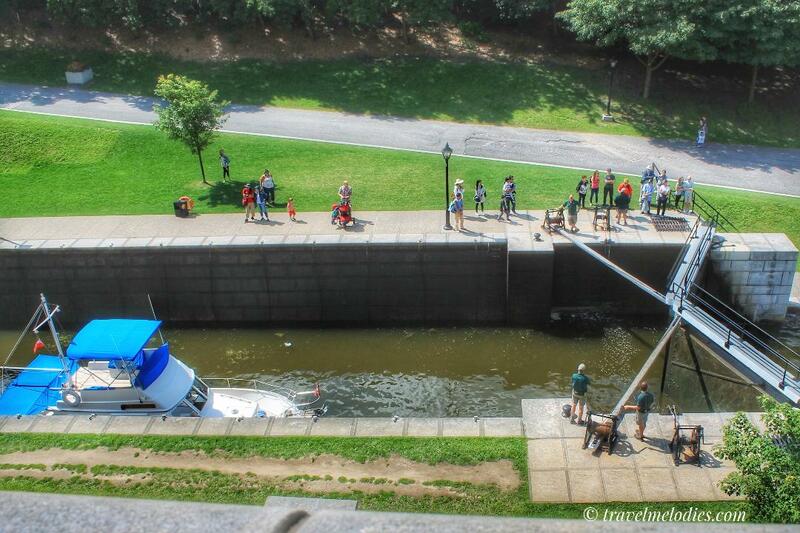 If you want to experience for yourself, there are boat tours and cruises available on Rideau Canal. During winter the canal gets frozen and turns into the world’s largest skating rink. Access to the rink is free. Let’s get those skates on and swizzle our way. Walk past the Ottawa locks along the famous luxury hotel Fairmont Chateau Laurier, towards Sussex drive. After a day exploring history, law and culture, it’s time to relax and breathe in some fresh air and savor beautiful views of the city from this park. Try the elaborate buffet spread at this upscale Indian restaurant with salads, vegetarian and non-vegetarian curries. Don’t miss the wide range of condiments, pickles and desserts. Ottawa downtown has so much to explore from art to shopping to history. Most of the attractions are on Sussex drive and Wellington street which makes it easily navigable. The headquarter of the Canadian Mint is a great place to explore how coins are manufactured and learn the history with a guided tour in French or English. There is even the world’s first million-dollar coin. Tickets: Tour prices are minimal around 8$ per person. Kids under 5 are not recommended. 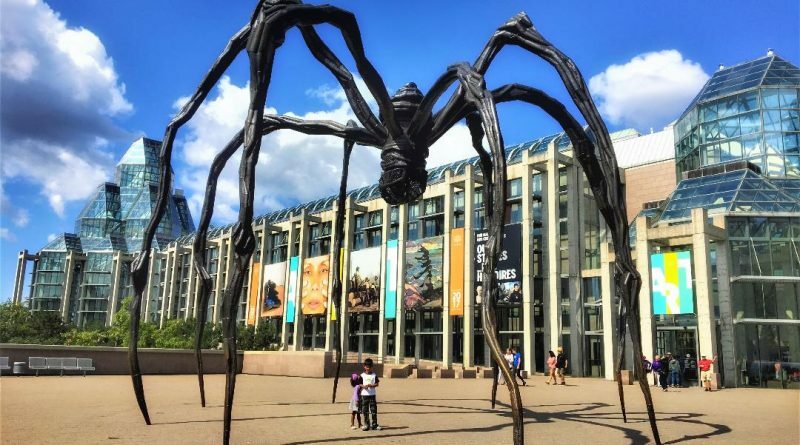 Timings: Tours start daily from 10 a.m. – 4 p.m.
A huge sculpture of spider outside welcomes you to the gallery which is hard to miss. 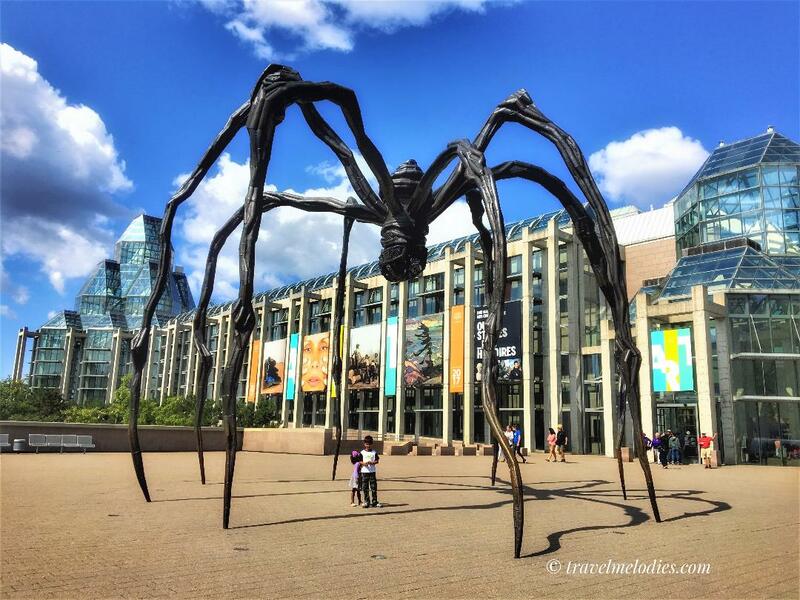 Maman (means mom in French), the spider is made of bronze and steel and bears a sac with eggs in it. If interested in art, the gallery is a great place to visit and get some stunning pictures. Head out to Canada’s oldest public market for a hearty lunch with variety of cuisines to choose from. It is also the best place to shop for local craft, famous Canadian maple syrup and other specialties and fresh produce. With over 600 shops and outdoor market you can’t miss to fill your bags here. 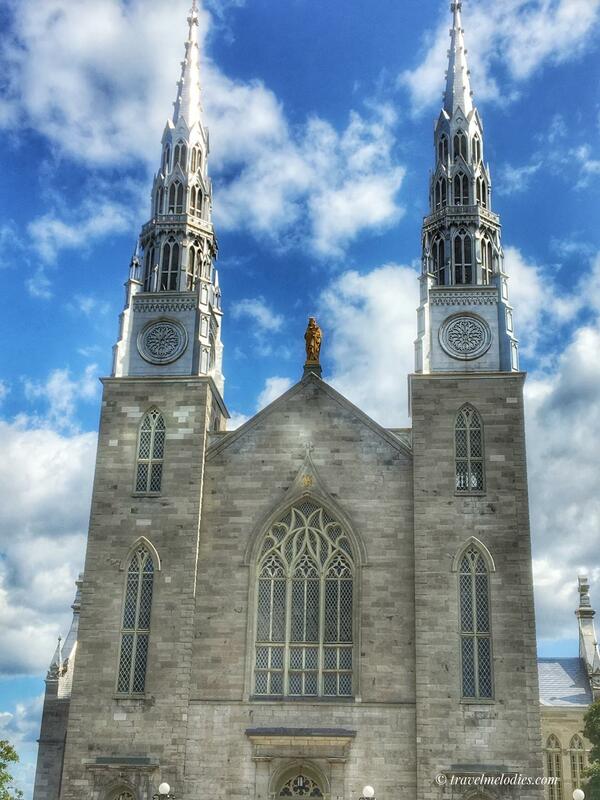 Another National historic site, the cathedral is the oldest and largest in Ottawa. The twin silver spires and mesh windows on exterior adds to the beauty. The interiors are equally charming with intricate carvings and bright colors. The official residence of the governor general is a historic mansion that has housed many Governor generals and has so much history attached. The best way to peep into those interesting stories and the art and furniture is to take a free guided tour. To get more of the royal feeling, head out to the garden outside and have a picnic or walk to gaze at the blossoming flowers. We were not able to visit as an event was planned on the day, hence closed for public tour. Timings – For timing and requirement of reservation, refer to Rideau Hall. The idyllic way to end the sojourn would be to walk along the Rideau Canal and reminisce the beautiful memories spent in the city. There are bike rentals also available if interested in biking along. You could sit back and relax along the green path, enjoy the vistas or capture some moments on lenses. There are no public restrooms inside the East and Center block, but outside between the two buildings. Only small bag is allowed inside the tour of Parliament Hill. Security screening of the visitors and their belongings happen before entering the buildings. 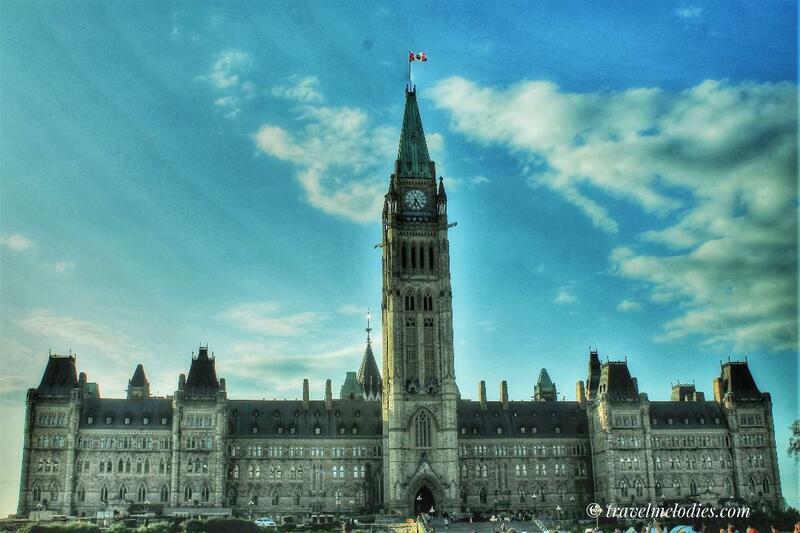 Free parking is available in World Exchange Plaza on weekends which is 2 blocks away from Parliament hill. Paid street parking and parking garages are also available nearby. If you choose to walk around the downtown, strollers for kids would be beneficial. Wear comfortable footwear for walking. If you have more time or days to explore, check Canadian museum of history, Diefenbunker- Canada ‘s Cold War museum. If visiting in summer, don’t miss the Light and Sound show at Parliament Hill grounds. Neha Kulshrestha – A software engineer by profession and a travel blogger by passion, Neha loves to travel with her family. 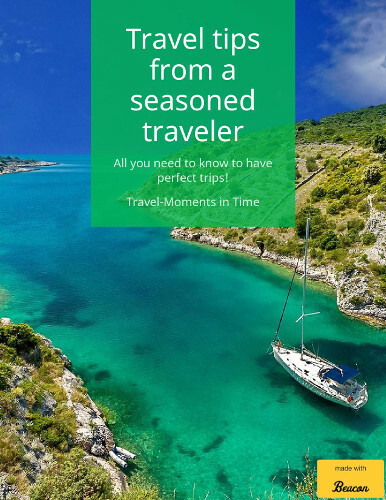 Her love for travel has grown leaps and bounds with time. From traveling with her parents to traveling as a couple to traveling with kids; she has come a long way. She blogs at Travel Melodies. Follow her travels on social media as well. For more Canada inspiration head over to this article for a 2-day itinerary for Quebec City and here to discover the top attractions in Montreal.